LOGAN SQUARE — The 606's Bloomingdale Trail could finally get designated bathrooms courtesy of a gym at the trail's west end. McCormick Tribune YMCA, 1834 N. Lawndale Ave., is planning to build two public bathrooms specifically for trail users, as well as a two-story, 13,000-square-foot addition that will house two pools, two multipurpose rooms and a family locker room. The bathrooms are a requirement included in an ordinance introduced by Mayor Rahm Emanuel tied to the sale of city-owned land to the YMCA. The deadline for building the bathrooms would be December 2018 under the ordinance, which was approved at Wednesday's meeting of the Committee on Housing and Real Estate and is scheduled to go to the full City Council for a vote on May 24. A YMCA spokeswoman said construction on the project is scheduled to begin at the end of July. It will feature two individual stalls. The spokeswoman said the public bathroom hours will match the YMCA's operating hours, which are currently 5 a.m.-10 p.m. weekdays, 7 a.m.-7 p.m. Saturdays and 9 a.m.-5 p.m. Sundays. The 606, like all Park District parks, is open from 6 a.m.-11 p.m. daily. The ordinance is a sign plans are moving forward, which is welcome news to trail users and local business owners who say designated trail bathrooms have been sorely needed since the 2.7-mile-long elevated trail debuted in 2015. “It’s good [news] for us. We have a lot of toilet use without people buying anything. Nobody gets refused; I understand the situation,” said Alpash Patel, general manager of Snappy Mobil, a gas station at 1750 N. Western Ave. next to the trail's Western ramp. Last summer, as many as 100 trail users asked to use the gas station’s bathroom, workers said. 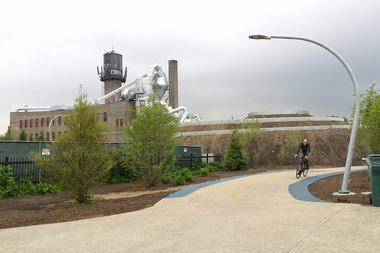 On Tuesday, a spokeswoman for the 606 said there were about 1.6 million trail users last year, and so far this year the number of users is "trending up 15 percent," based on a report generated by the U.S. Forest Service. The lack of bathrooms at any of the four ground-level parks along the trail has been a consistent gripe from trail users and business owners like Peter Park, co-owner of En Hakkore, a Korean restaurant across from Churchill Park. In an interview last summer, Park said the extra business from the trail had been "wonderful," but noncustomers coming in just to try to use the bathroom "is a hassle." "Our bathroom is not easy to get through. You have to walk past the kitchen. If they're not customers, we have to say no [to the request], but if it is a baby, or small child, we understand," Park said. Ben Helphand, president and co-founder of the volunteer organization Friends of Bloomingdale Trail, said the "YMCA solution is a very nice solution," but he would like to see more restroom options along the Bloomingdale Trail corridor. “Some people say not all public parks have toilets, but this is a unique space. It’s very big and very long. It’s the kind of place where people spend more time," Helphand said. He added not all businesses have been annoyed. "They say people come in off the trail to use bathrooms and buy things, too," he said. Part of a larger Chicago Park District system dubbed the 606, named for the first three numerals of the ZIP code all Chicago residents share, the trail runs along a former train line from Bucktown and Wicker Park on the east to Logan Square and Humboldt Park on the west. The addition of two public bathrooms is part of an amended ordinance related to a city land sale agreement with the YMCA. The commissioner of the Department of Planning and Development requested the amended ordinance, Emanuel wrote in the document's cover letter. Who's on @the606chicago 11:15 a.m. Sunday?